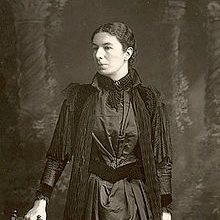 Mary Ward (1851-192) was born into an illustrious family – her grandfather was Dr Arnold, educationalist and reforming headmaster of Rugby School, her uncle was the poet Matthew Arnold whilst Aldous Huxley was her nephew. She spent her teens in Oxford, moving in academic circles and eventually marrying a Fellow of Brasenose College, Humphry Ward, at the age of 21. Mary Ward was passionate about education for women and became very involved in the negotiations surrounding the foundation of Somerville College in 19879. Indeed, she it was who suggested that the new institution should be named after the renowned mathematician and astronomer, Mary Somerville. She was appointed as the first secretary of the Somerville Council (a position jointly held with Mrs Vernon Harcourt) and worked tirelessly, preparing for the arrival of new students despite being eight months pregnant when the College opened in October 1879. In 1881 she moved away from Oxford with her family and developed her writing career, concentrating on social issue novels. She went on to publish 26 novels under her married name of Mrs Humphry Ward, which were best-sellers in their time. She also set up a settlement in London for the promotion of education and social services to the population of a deprived area of London, a service that survives today and now bears her name, the Mary Ward Centre. Although enthusiastic about education for women, she was less keen on the idea of votes for women and actively campaigned against suffrage in the early 20th Century, much to the dismay of many at Somerville. She died in 1920 at the age of 69.